We sampled three of the 12 concoctions and gave each a high rating. 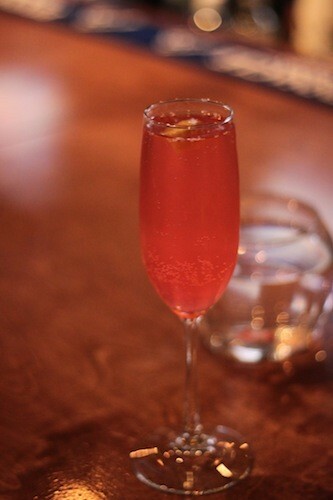 The French 79 (above) was tart and refreshing, made with 209 gin, lemon syrup, Prosecco, rhubarb bitters, and cranberry bitters. With spring rolling in, it seems that Memphis beer events are finally picking up once again after a very dry winter. And to kick off the season, the fourth installment of the Beer vs. Wine dinner series is coming up. For those who have not yet attended one of these events, the premiss is fairly simple: five courses are served paired with a different wine and beer for each dish, and attendees vote at the end of each course on which beverage better complimented their food. Votes are tallied at the end of the night, and so far, beer has walked away each time victorious. To keep things fair, Southwestern Beverage is sending along their wine and beer gurus, Bill Huddleston and Michael Barzizza. They not only arranged the beverage menu, but will also be present at the event to guide diners through the complexities of each pairing. The dinner will be held on April 10th at Amerigo, beginning at 6:30 p.m. Price is $60.00 a person, plus tax and gratuity. Call 761-4000 for reservations. At Andrew Michael Italian Kitchen's monthly No Menu Monday dinner, there is a menu, but the diner does not see it until after the meal. As the courses are brought out, dinner becomes a fun sort of parlor game of guess-the-ingredient. At the meal's conclusion, each diner is given a copy of the menu. 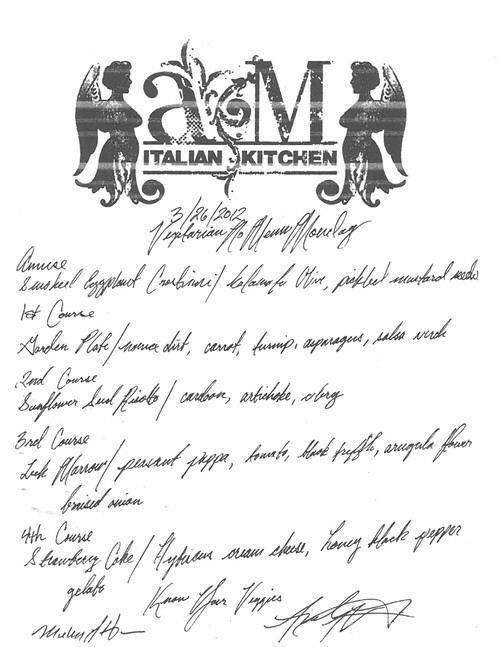 Seen below is the menu from last Monday's special vegetarian No Menu Monday. I have to admit, even with menu in hand, I'm still doing a bit of guessing. On Thursday, March 29th, 6 p.m., it's the annual Jack Daniel's Meet the Master Taster Dinner & Whiskey Tasting at the Peabody's Capriccio Grill. 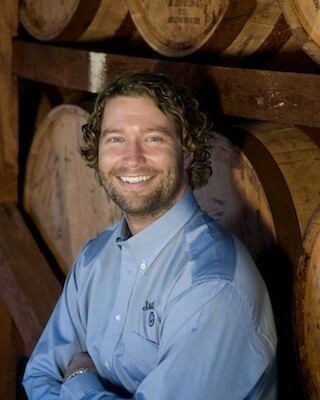 The master taster diners will be meeting is Jeff Norman whose company bio includes the quote, "Most people find it hard to believe that I actually taste whiskey each morning before I have my first cup of coffee — in order to taste with a clean palate." Norman spoke to Hungry Memphis about what being a Jack Daniel's master taster involves, the Peabody dinner, and his cocktail of choice. Flyer: You taste whiskey first-thing in the morning? Jeff Norman: We bottle whiskey every day, Monday through Friday, and as we’re bottling, there are samples from those bottling tanks that we check before that bottling tank is released. So the first thing I do when I come in is taste a few of those samples and give it my blessing and away we go. I have travel anxiety. A simple weekend trip to Atlanta to visit family will have me fretting over the correct number of socks and underwear (as if they don't sell socks and underwear in Atlanta). At the airport, I check to see if I have my ID, I check to see if I have my ID, I check to see if I have my ID. A little bit of this mania extends to whenever I go out to Collierville. I must try somewhere new (at least to me) to eat. I plan. I ask around. On my last Collierville trek a few days ago, I chose BooYa's. 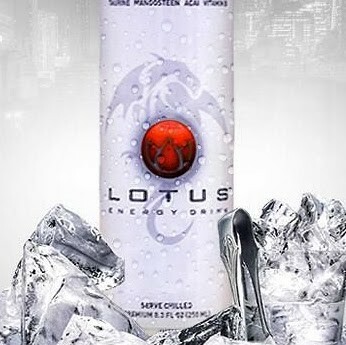 On Friday, March 23rd, from 6 to 9 p.m., there will be a launch party for Lotus Energy Drink at bleu in the downtown Westin. Lotus was created by Nashville-based siblings Jay and Thomas Umboh and Li Jackson and was introduced to the Nashville market a couple years ago. For help in getting the drink into Memphis and beyond, the trio approached Lennard James. James is the CFO of Enzo Entertainment. His business is concert promotions, not food & beverage. But the gear-shifting didn't faze James. "I can sell peanuts to an elephant," he says. Lotus is made in Austria, home of the daddy-of-'em-all energy drinks Red Bull. James says that there are a few things that sets Lotus apart from Red Bull. Coworker C told me that he doesn't follow sports, but he does have season tickets to Tiger basketball. The way he explained it to me was that, while he's not a sports fan, he is a fan of Memphis. As the 5 o'clock hour approached last Friday, Coworker C was getting a little antsy to get home and prepare a batch of Cheladas — a tradition he keeps before each Tiger appearance in the NCAA tournament. I had never heard of Chelada. A little googling brought up the words "beer" and "clam juice." Similarly, when I pick up a cookbook, the first thing I do is flip to the index and look for "Upside Down Pineapple Cake." It's not that I think this dessert is the standard bearer (though what is?). There is something just charming and retro about it. So, when I saw this adorable mini cake at Lunchbox Eats, I had to try it. 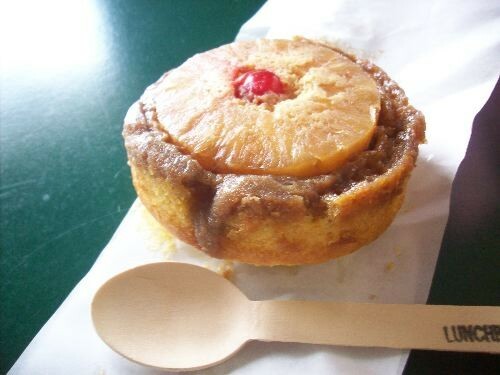 Lunchbox' upside down pineapple cake ($4.99) gets everything right. It is moist, buttery with a thick brown-sugar glaze. The pineapple aptly cuts into the richness just a bit. First I promised the fruitcake to Hungry Memphis' 1 millionth follower on Twitter (only 999,653 shy!). 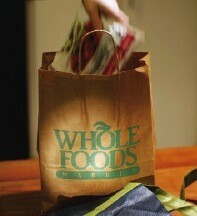 When that disappeared, I offered the romance novels. Now those are gone. But, but... 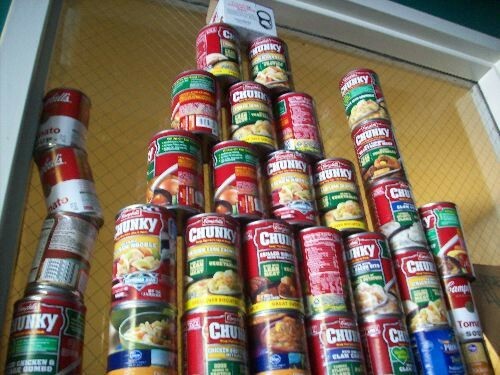 I've got something new: Pyramid of Soup. This original piece of installation art is currently at the Flyer offices. I will have the artist personally install it at the home of the lucky 1 millionth follower. 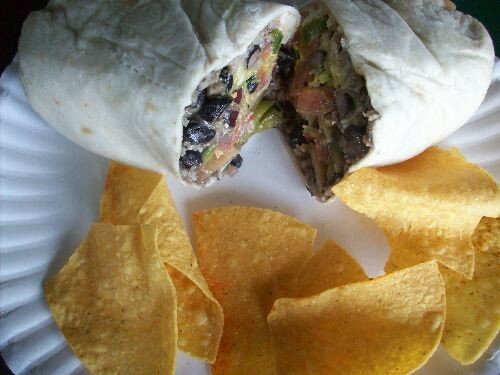 Follow Hungry Memphis on Twitter @hungryflyer. 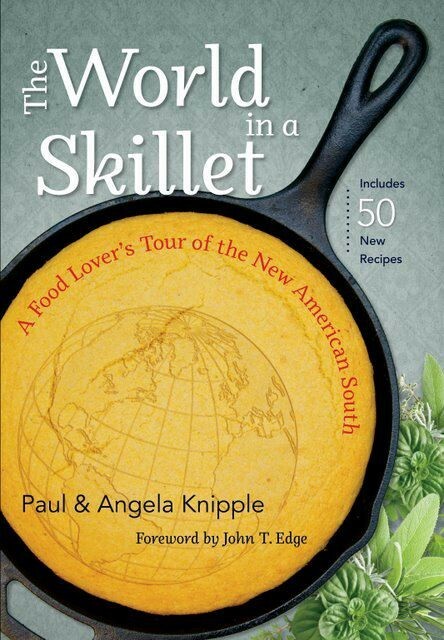 On Sunday, March 18th, Restaurant Iris is hosting a dinner celebrating Paul and Angela Knipple's fantastic new book The World in a Skillet. The book is a series of profiles of first-generation immigrants living around the South whose cooking is both informed by their roots and their new locale. The book contains loads of the recipes. For the dinner, Iris chef Kelly English will present his take on a handful of these recipes. Since there really wasn't a winter I'm having trouble wrapping my head around the fact that it is almost spring. 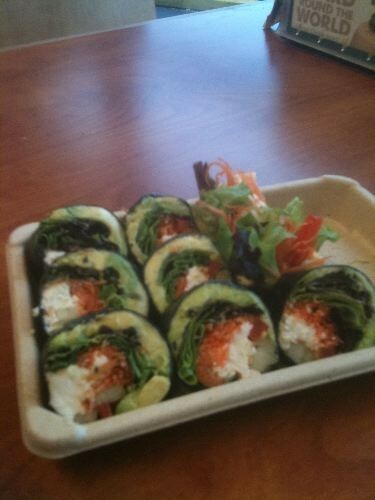 One happy sign of the new season is the Miso Garden Roll with Tofu ($6.99) at Whole Foods. Andrew Ticer and Michael Hudman of Andrew Michael Italian Kitchen are in the running for Food & Wine magazine's The People's Best New Chef, Southeast. Voting ends Sunday. Have you check out this week's cover story? 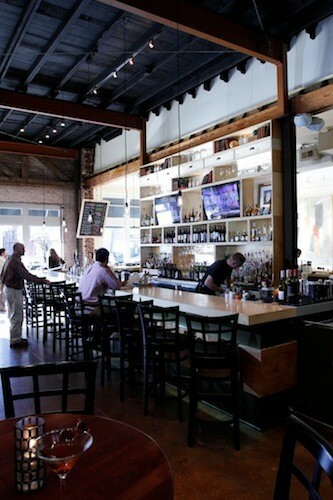 The Flyer wrote up a "Bar Exam" and gave it to seven local bartenders: Ben Rhea of Interim, Michele Fields of Max's Sports Bar, Brad Pitts of Bari, Leanna Tedford of Jim's Place, Erin Patterson of Blue Monkey, and Allan Creasy of Celtic Crossing. Here are a few things that did not make the story. We asked Leanna Tedford if she had ever had to put someone in a headlock. "Headlock? No," she answered. "But there was one time when I should have and would have if I didn't have a hernia. Medical exemption? "